Since I spent from August to October in Paris, when I got the Little Yellow Bicycle Hello Fall paper I thought of how my French pictures could be used. I loved the colors and they reminded me of the French market in my small town where I got vegetables each week. 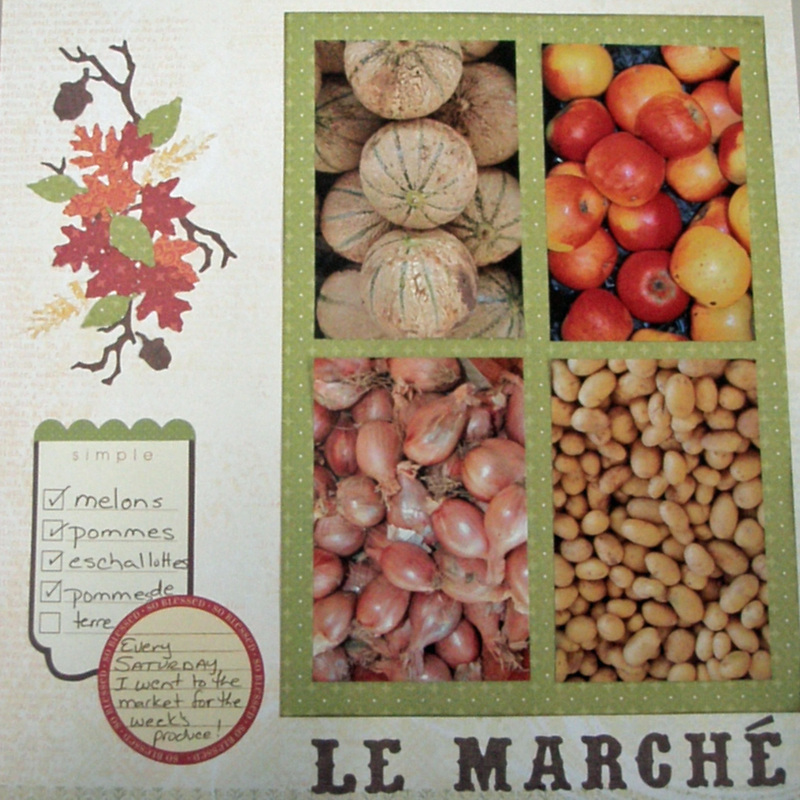 I picked four pictures of the produce and put them on a 7 ¼” x 10 ¼” piece of Green Splendor. I used Ivory Text paper for the background. 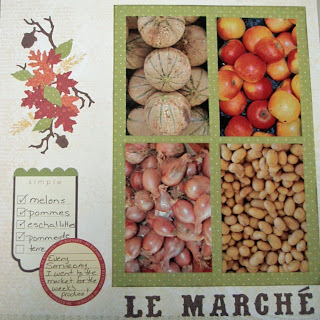 I was really excited that I had the opportunity to use the Sizzix Tim Holtz Alterations Autumn Gatherings die to cut out small leaves and branches. I cut a few out of each Walnut Knit/ Green Splendor, Golden Flourish, Red Splendor, & Burnt Orange Knit. A new trick I learned was using the Xyron X so that all the little pieces were stickers. This made them much easier to affix to the page. The title was cut using another of my favorite Tim Holtz Alterations dies – Vintage Market Alphabet. These letters are decorative and I find them to be just the right size for titles. To create space for journaling, I used three journaling cards from the Hello Fall set. You only see two because I cut the bottom off a green journaling tag to create the top of the simple pleasures journaling tag. Simple pleasures described my Saturday morning trips to the market and the tag had little boxes that reminded me of a grocery list. I simply listed the items in the pictures using the French word for each item.. In the circle journaling tag, I briefly described my experience.